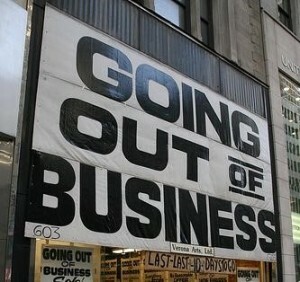 In discussing the out of business corporation, one must first understand the nature of corporations in this country. The U.S. corporation is a legal entity unto itself, separate from the principals or directors. In other words our law regards a corporation as an actual person, complete with its own life, health, wealth and death. It exists at the discretion of the State to grant it a Charter for the benefit of the corporate stockholders. I suppose you could call the Charter, it’s “birth certificate”. However, unlike a real person, the corporate entity cannot stray from the purposes defined in the Charter for its existence. The purpose of the corporate entity (beyond making money) is to hold the principals (who reside outside the corporate “body”) free from liability. Therefore, when a corporation dies, it is extremely difficult to attach liability to any of the principals. As in most countries, the majority of U.S. states have set procedures to properly conclude or dissolve the affairs of a corporation. However, as a practical matter, those steps are only required if the principals wish to resurrect the corporate body at some point in the future. There are no real penalties or consequences for the principals for failing to follow the dissolution steps. That being the case, some corporations cease all operations by simply vacating the premises, sometimes in the middle of the night without any warning. Where does that leave the unsecured creditor? In most instances, frankly, it leaves them without any recourse at all or any chance of any recovery. In fact, it is safe to say the vast majority of unsecured debts owed by out of business corporations are never paid – not even in part. This is a basic fact of business life in the United States. Is it possible to pierce the corporate veil and attach liability to the directors? Or, if a new company has been formed to hold it responsible for the defunct company’s debts? With significant legal effort, it may be possible. However, it should be underscored that such effort will be an expensive endeavor to any creditor undertaking the task. The typical scenario for this battle will entail demonstrating to a court (in a lawsuit) the principals either commingled their personal assets with those of the corporation or actually transferred the assets of the initial corporation upon its demise. Either is a very heavy burden to prove under our legal system, requiring definitive evidence – not merely an allegation. Unsecured creditors may be tempted to commence such a lawsuit against the new corporation in the hope they can discover the needed evidence along the way. However, the Fifth Amendment of the U.S. Constitution provides that no person (and that includes corporate entities in this example) shall be forced to testify against himself. Consequently, a corporation cannot be compelled to provide its records to others hoping to first develop prima facie evidence of wrongdoing. Requesting a Court to compel such production of documents can only be attempted when there is already a prima facie evidentiary foundation to demonstrate to the Court that the records exist to support the theory of wrongdoing. Therefore, beginning this type of action without proper evidence in hand could place you in athe unenviable position of defending yourself against a malicious prosecution lawsuit! So is it hopeless to even think about such an action? Definitely not, if you are absolutely convinced there was wrongdoing. But do some decent research before beginning the legal process. When attempting to prove commingling of corporate and personal assets, you might take a lok at some of the payments received from the debtor before he went out of business. Were the checks drawn on the corporate or personal bank account of the principal? This doesn’t, on its own merit, demonstrate commingling – after all, the individual may have been using his own separate money to help “finance” the corporation. However, note the fact and set it aside for future reference by your lawyer. Now look at the reverse – were any of your checks, which were sent to the corporation deposited into the personal bank account of the principal? Were the goods shipped to the debtor’s personal address or to the corporate address? If software was purchased, was it registered to in the name of the corporation or to an individual? If to the individual, note the fact and set it aside to give to your attorney. Do you have any evidence of vehicles or property owned by the corporation being transferred to the title of the principal? Again, note the fact and share it with your lawyer. Your attorney can also obtain public documents kept on file by the local State government which may prove useful. Initial capitalization records may show the corporation was under-funded at its inception. State records will also show the purpose of the founding of the corporation and your efforts now may show the corporation strayed from the chartered purpose of the organization – Was this a violation of their charter? This is something for evaluation by your lawyer. Were the Minutes of the Annual Meeting of Shareholders kept and filed with the Secretary of State? Failure to do so may indicate the corporation was so closely held that it, in fact, operated as a non-corporate entity. You may even consider hiring an undercover investigator to take pictures of personal use of corporate equipment. You will have different hurdles to overcome if attempting to prove successor liability. The buyer company expressly or by implication promised to assume the seller’s obligations. The acquisition amounts to a de facto consolidation or merger. The buyer is a mere continuation of the seller. The new company was formed for the purpose of defrauding the predecessor’s creditors or specifically violates the transfer laws of the State in which the seller was incorporated. You might be able to sue the prior, though defunct, corporation for the purpose of gaining the right to subpoena the principals of both companies and to examine them under oath to see if any inventory has been wrongfully transferred. Or, if you can develop enough evidence to prove the successor corporation is a mere continuation of the out of business company, it may be possible to convince the principals to pay in full or to settle the obligation short of the necessity for legal action. Continuity of employed personnel, physical location, assets, and general business operations. A number of approaches can be taken, but you will want to move quickly. There is a two-year Statute of Limitations in fraudulent transfer cases in many States. However, any debtor intentionally attempting to defraud is not going to sit still so you can build a case against him. You don’t want to give him time to sell the transferred inventory, or even close down and open up yet another business. There are many instances of corporate entities going out of business where there is no intent to deceive or commit fraud. Indeed, honorable people can and do fail at business. Many times, a principal may contact a creditor and give the creditor advance warning of the impending failure of the business and in those instances offer a settlement for a reduced amount of money, some inventory or other means for mitigation of damages. As long as there is no bankruptcy being filed, serious consideration of such offers should be given if the bonafide nature of the offer can be substantiated by some means. Obviously, it would be better to get “something rather than nothing”. Is it ever possible to see a recovery when your corporate debtor goes out of business when the principles are driven by malevolent motives? There answer is “yes”. However, it remains a matter of economic and common sense to determine if the effort to be taken is worthwhile. Before undertaking any of the actions outlined above, the bottom line question should be: Does the potential outcome justify the costs? You should have a reasonable assurance the principals have sufficient assets to result in a recovery and those assets should be sufficient to cover not only your account but your costs. If they don’t will just the satisfaction of “bringing a crook to justice” really be worth your time and money?